Choose ideal color palettes for projects. Is there a better alternative to ColorPaj? Is ColorPaj really the best app in Illustration category? Will ColorPaj work good on macOS 10.13.4? 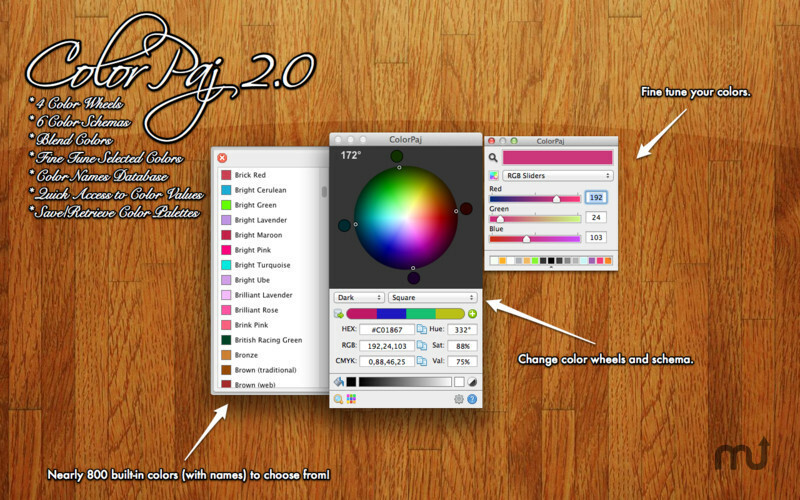 ColorPaj simplifies the tedious task of finding the best color palettes for your projects. By choosing the different color schemes, ColorPaj will automatically find the best matching colors for you to use based on some of the most common color theories today. ColorPaj makes it easy and fun for you to create custom color palettes as well as getting CMYK, RGB, and HEX values quickly. ColorPaj needs a rating. Be the first to rate this app and get the discussion started! ColorPaj is also a great learning tool for beginners because all of the mechanics behind ColorPaj are explained in the "Color Basics" section. You can experiment and see how each theory works by reading about it and testing them out inside ColorPaj.